Tackling the world’s biggest waves since he was a young boy, Laird Hamilton has transformed his passion for the surf into his life’s work. In addition to writing about his experience both in book and blog format, Laird inspires surfers around the globe with his ongoing enthusiasm for the ocean lifestyle. His passion for big waves is met on land with dedication to philanthropy, environmental conservation and innovation, a window into which Laird shares in this latest interview. Conscious Connection: Take me through a quick day in the life of Laird Hamilton. How do you get your day started? Laird Hamilton: I love to start my day with espresso and typically a liter of water, sometimes amplified with lemon and a bit of Himalayan salt. I add to that at least eight hours of sleep, and when I can dictate my bedtime, I’m up at 6 a.m. I really like the fullness of having the whole day. I always feel bad when I wake up and the sun is up already. Once my day starts, my training sessions alternate daily between pool and gym workouts. I have a pool training circuit I’ve developed with weights, and I like to thermo-regulate by following it up with session in a hot sauna or in my ice tub, in which I can sit and practice mind control. We also train at the beach, working in the sand. Of course when the surf’s up, everything gets puts aside. We had a great swell last week, so I might have had twenty hours of surfing in a handful of days. Conscious Connection: Talk a little more about the circuit training you’ve outlined in your book, Force of Nature. 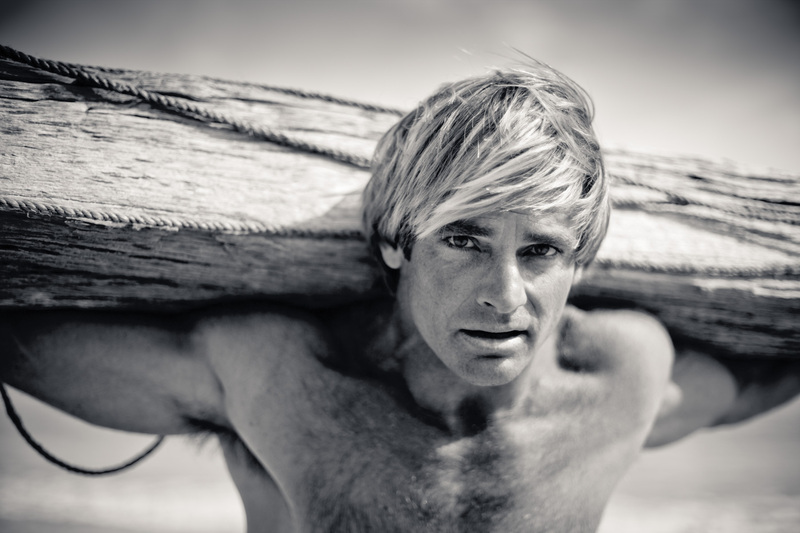 Laird Hamilton: My overall philosophy is to create as many variables in my workout as possible. We always say, “smarter, not harder.” How do we make it challenging and new? By creating as much variety as we can, from controlled, conscious breathing to exercise variations to keep the body guessing. In the gym, I like compounding, where you work on multiple aspects, such as range of motion or flexibility. I might do a hybrid of weights, yoga, and cardio again in an effort to trick yourself and keep it interesting. Workout boredom leads to complacency, which leads to sublevel performance. You need to continually challenge yourself through variety because when you are learning something new you get a lot more out of it. Conscious Connection: What are three things you do daily that help you maintain balance and keep you in peak shape? Laird Hamilton: The number one thing you can do is have a conscious awareness of your body. Know your strengths and weaknesses, where you need to devote your energy. Number two would be practicing conscious breathing and good body mechanics. This awareness of your body in space – how you walk, how you sit in a chair, how you bend over – has a big effect on your body. And finally, no matter how you do it, from sitting in a sauna to getting on a spin bike, you need to sweat at least once a day. Laird Hamilton’s historic ride at Teahupoo, Tahiti. Conscious Connection: What goes through your head as you charge a big wave? Laird Hamilton: There is something in that moment that forces you to be very present. When you are out in big surf, you enter a sort of meditative state. Of course you feel a range of emotions when you’re out there – elation, fear, uncertainty, doubt – but I think most essential is a positive attitude. You also have to be confident in your abilities and believe your preparation far outweighs some imperfection of performance. Relying on your instincts is key too. You have to listen to that inner voice that is more connected to your surroundings. Conscious Connection: What are your thoughts on a higher power or a universal intelligence? How does spirituality impact your success? Laird Hamilton: If I didn’t have faith in something much greater than all of us, I wouldn’t know how to live. There is nothing like getting in front of a giant wave to remind you of your insignificance, that we are humble servants to a far greater power. That being said, don’t tempt the master of the universe. There are signs all around us to show us there is something out there that ultimately keeps us in line. Conscious Connection: Speaking of mortality, what was the closest you’ve ever come to drowning? Laird Hamilton: I think I’ve been scared so many times when I was young that I don’t scare as easily anymore. When I was a kid I would get a five or six foot wave to pull you under – they don’t need to be big to rock you, so I used to get rescued once a week. I’ve had some big hold-downs. In fact, I had a huge wreck this past winter. There was a real weird day and I went against my instinct, I caught a giant one, straightened off and got blown up and plowed under. All in all, I think it was pretty forgiving. Once every few years I get my self in a big crash, but I try to minimize those. I still have fear; I just have a higher threshold. Conscious Connection: In your opinion, what is the most dangerous wave in the world? Laird Hamilton: I couldn’t pinpoint one spot; there are five or six spots in the world that are dangerous, and then the swells add to that danger. When you get into deeper water waves, you have the danger of being held down or, like the Bonzai Pipeline, you have the risk of hitting bottom. Ship Stern Bluff can look like an ugly wipe out as its all shell and the waves don’t break evenly. Conscious Connection: Can you tell us about your environmental initiative, RainCatcher? Laird Hamilton: RainCatcher, started by a friend of mine in Malibu, is a rain-catching system that we implemented in villages across Africa, setting it up in schools or town halls to catch rainwater falling from roofs. . It catches the water, runs it into a tank, and filters it. We’ve already provided almost 850,000 people with clean water. Some kids are reluctant to drink the water at first because it’s clear and they are used to drinking muddy water. It’s a very practical solution for a problem, which is why I like it. We try to do as much as we can to support various organizations, from environmental initiatives to those supporting research for autism and cystic fibrosis. I believe in leading by example, so I think if we tackle the issues that we face globally we will start taking better care of ourselves as well. You start there, and then you can do some great stuff. Conscious Connection: What do you think about the eco-board and sustainable surf movement? Are you involved at all? Laird Hamilton: Not directly, but we always have our ears on it. I can’t believe we’re not there sooner, but we have to face some restrictions, like getting materials, and then getting them to perform to the level we expect them to. I want to build the idea and eventually have all our boards be environmentally friendly, but first we need to find some universal means for such boards to be created. As toxic as surfboards are, sometimes I feel that they are like a small grain of sand on a large hill of environmental troubles. Although we’re real close, and I’m looking forward to it. Conscious Connection: What is your number one tip for readers who want to change the world and have fun doing it? Laird Hamilton: Just remember that it all starts with you. We undermine a lot of our existence just by being hard on ourselves, so I think make a conscious effort to be good to yourself and be involved. And you have to have a dream. You’ve got to see yourself somewhere; that’s the foundation for a lot of great things. Conscious Connection: Any exciting new projects or initiatives you’re working on? Laird Hamilton: Our GolfBoard project is blowing up. It won Product of the Year at the PGA Tradeshow, and its currently featured in an article in Golf Digest. We like to stir it up, and this could be one of the tools to really impact golf. We’re connecting surfing with golf. The board is universal for all ages, it speeds up the game, it makes good players play better . . . I think it’s going to be hole in one. For more information on Laird, including links to his blog, click here. You learn more about Laird’s efforts towards clean water in Africa, RainCatcher, and his exciting new project, GolfBoard.